Interpol has issued red notices for the 11 suspects in the murder of the senior Hamas leader, Mahmoud al Mabhouh, on January 19, with Dubai’s police chief confirming that the Israeli foreign intelligence service Mossad was involved. Paul Woodward, who writes the War in Context blog, has monitored this story since it first broke with the announcement (above) from the Dubai police chief. In early January two black Audi A6 limousines drove up to the main gate of a building on a small hill in the northern suburbs of Tel Aviv: the headquarters of Mossad, the Israeli secret intelligence agency, known as the “midrasha”. Binyamin Netanyahu, the Israeli prime minister, stepped out of his car and was greeted by Meir Dagan, the 64-year-old head of the agency. Dagan, who has walked with a stick since he was injured in action as a young man, led Netanyahu and a general to a briefing room. According to sources with knowledge of Mossad, inside the briefing room were some members of a hit squad. As the man who gives final authorisation for such operations, Netanyahu was briefed on plans to kill Mahmoud al-Mabhouh, a member of Hamas, the militant Islamic group that controls Gaza. As evidence and strong speculation builds toward absolute certainty that Netanyahu ordered, and Mossad carried out, the murder of Mahmoud al Mabhouh, should we expect the Israeli government to apologize, as it was forced to do when then (and once again) Prime Minister Bibi Netanyahu ordered an assassination attempt on Hamas leader Mishal Khalidi in 1997? Times have changed since 1997. Israel, the major military power in the region, now dictates the rules of engagement. Israel does not normally respond to stories alleging misconduct by the Mossad. The Palestinian newspaper Ma’an, reports on how Avigdor Lieberman, Israel’s foreign minister, responded to the allegations that his government is behind Mahmoud al Mabhouh’s murder. Israeli Foreign Minister Avigdor Lieberman said that there was no definitive proof Israel’s intelligence agency carried out the assassination, although he stopped short of denying it. . . Lieberman stressed however, that he was neither confirming nor denying responsibility for the killing. You got that? Lieberman denies involvement and then says Israel never responds, confirms nor denies involvement. Israeli cartoonists have little patience with ambiguous denials. They simply assume it was a Mossad-orchestrated hit. Will Barack Obama call Netanyahu, as Bill Clinton did in 1997, following the failed attempt on another Hamas leader, and force him to grovel after getting caught? Don’t count on it. Bibi is still building settlements over Obama’s objections. What’s one more assassination among friends? Israel sets the rules of warfare against any group or nation it deems to be an enemy. The New York Times cautiously acknowledged the unfolding story on its blog Monday morning, linking to European news sources. If the Times has a problem with Israel’s latest display of international arrogance, it is slow to say so. As for Israel’s own media response, the problems that Ha’aretz finds in the Dubai murder are purely strategic. In an editorial, Ha’aretz asks, was it good for Israel’s image? First, did the goal and outcome justify the risk of carrying out a hit in a moderate Arab country and of exposing the intelligence community’s modus operandi? Or did the operational opportunity to get rid of an individual responsible for past terror attacks and current weapons smuggling encourage those who approve and carry out such actions to waive some of the rules of caution? Second, in a tense period in which Israel is trading threats of war with Iran and its allies in the region, should Israel be goading the enemy instead of maintaining restraint? Third, is it right, because of this hit, to embarrass the authorities in the United Arab Emirates, who share with Israel the fear of the Iranian threat? Fourth, in preparation for the operation, were the risks of exposure and restrictions on similar future actions taken into account? Fifth, is there justification in damaging relations with friendly European countries whose passports were used by Mabhouh’s assassins? Sixth, is it proper to place in harm’s way the Israelis whose identities were ostensibly stolen and used by the assassins? It disappeared for about a decade and a half of “peace,” where it was perceived as weak; yet now it is back at full force. . . . The Goldstone Report, which claimed that Israel goes crazy when it is being attacked, caused us some damage (which should not be exaggerated) in the world, yet it was a blessing in our region. If Israel goes crazy and destroys everything in its way when it’s being attacked, one should be careful. No need to mess with crazy people. Triumphalism is a recent phenomenon in Israel, enhanced greatly by the rise of the Netanyahu hardline government. In the US, of course, triumphalism is in our DNA. These days we are finding common ground with our Israeli cousins. The Obama government’s triumphalism is now cruising along in its own morally repugnant and strategically unrealistic campaigns of targeted assassinations against Taliban leaders in Afghanistan. Glenn Greenwald constantly monitors and calls out US conduct when it violates basic American values and human rights. So in a modern refashioning of the obvious — that war is harmful to civilian populations — the United States military has begun basing doctrine on the premise that dead civilians are harmful to the conduct of war. The trouble is, no past war has ever supplied compelling proof of that claim. . . . [A]n overemphasis on civilian protection is now putting American troops on the defensive in what is intended to be a major offensive. . . .
Of course, all this is not to say that the United States and NATO should be oblivious to civilian deaths, or wage “total” war in Afghanistan. Clearly, however, the pendulum has swung too far in favor of avoiding the death of innocents at all cost. Does anyone need it explained to them why causing large civilian deaths through air attacks in Afghanistan is not only morally grotesque but also completely counter-productive to our stated goals? The US kills from the air with its impersonal drones. Israel kills in Dubai hotel rooms with trained assassins. For Israel, and now for the US, murder and assassinations of both targeted enemies and innocent civilians have become SOP (standard operating procedures), arousing only faint criticism on their respective home fronts. The US, which has forgotten the lessons it should have learned in Vietnam, now follows the Israeli model of warfare, i.e., civilians are expendable in order to win short term military victories. An errant NATO missile strike killed 12 civilians in Helmand province Sunday (February 14), the largest single loss of life of non-combatants since a massive coalition offensive began over the weekend. Coalition commander U.S. Gen. Stanley McChrystal immediately issued an apology for the incident, and suspended use of the truck-mounted missile system used in the strike until further notice. Since the killing of veteran Hezbollah leader Imad Mughniyeh in Damascus in 2008, Israeli-hallmarked assassinations have multiplied in Lebanon, Syria and Iran. Coldblooded killing isn’t only a morally repugnant crime. The lesson of colonial history is that decapitation campaigns against national resistance movements don’t work. In the short term they can disrupt and demoralise, but if the movement is socially rooted, other leaders or even organisations will take their place. What would lead Israel and the Obama White House to abandon their common heritage of moral values and pursue such monstrous and ultimately “doomed to fail” military tactics? Of late, I have been reading Henry James. Leon Edel, a Jamesian scholar, writes an introduction to a volume of the works of James which reproduces short works written from 1900 to 1903. Discussing what is perhaps James’ most famous story, “The Beast in the Jungle”, Edel concludes that James writes with a “prevision” of twentieth century existential man as “disassociated, ridden by anxiety, fashioning out of his malaise, a secular and almost pathological dream of special privilege”. This is, for me, a warning from the past. Israel’s self destructive behavior, which the US not only condones but emulates, is driven by a dangerous anxiety and an “almost pathological dream of special privilege”. And we should have a problem with that. 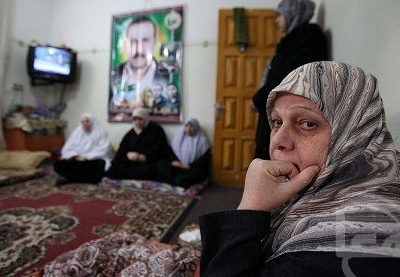 The picture at the top was taken at the home of Mahmoud al Mabhouh, where relatives gather to mourn his death. It is a Ma’an image and was taken by Wissam Nassar. 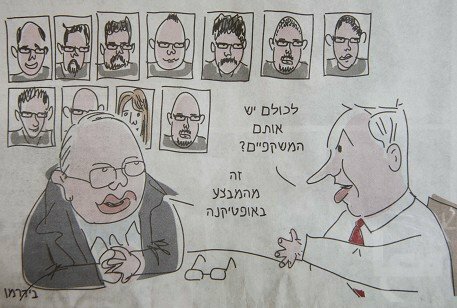 The cartoon is from Ha’aretz. It was reproduced in the Palestinian newspaper Ma’an. Thanks for following this story so closely. I’m not comfortable with the equation of US and Israeli models of warfare (I think the contexts are distinctly different) but you are spot on that moral values are at stake in both situations and our use of technological warfare makes it even harder to distinguish when we cross the line. Thanks too for the James quotation. That “dream of special privilege” has been with us a long, long time. More pathological now? Maybe not, but probably more dangerous. Personifying the U.S. and Israel as current day John Marchers, the protagonist of Henry James’ “The Beast in the Jungle”, was astutely perceptive and very, very original. I’m envious because in reading “The Beast….” I failed to adequately plumb the depth of meaning that James intended, while you did. I put greater emphasis on the interpretation that James was bitterly regretful of his neglect of his friend Constance Woolson who I think greatly loved him. Tragically that love was unrequited just as was May Bartram’s love for John Marcher (alias Henry James). If you haven’t read it yet I’m sure you’ll greatly enjoy Leon Edel’s biography of James, the one volume paperback which condenses the monumental five volume work. (Henry James: A Life. 1985, Harper & Row).